A short treatise on the various forms of yoga, including Hatha, Raja, Karma, Bhakti, and Jnana. The book also has chapters on the science of breathing, and the possibility that Christ was a Yogi. TRUE religion is extremely practical; it is, indeed, based entirely upon practice, and not upon theory or speculation of any kind, for religion begins only where theory ends. Its object is to mould the character, unfold the divine nature of the soul, and make it possible to live on the spiritual plane, its ideal being the realization of Absolute Truth and the manifestation of Divinity in the actions of the daily life. Spirituality does not depend upon the reading of Scriptures, or upon learned interpretations of Sacred Books, or upon fine theological discussions, but upon the realization of unchangeable Truth. In India a man is called truly spiritual or religious not because he has written some book, not because he possesses the gift of oratory and can preach eloquent sermons, but because he expresses divine powers through his words and deeds. A thoroughly illiterate man can attain to the highest state of spiritual perfection without going to any school or university, and without reading any Scripture, if he can conquer his animal nature by realizing his true Self and its relation to the universal Spirit; or, in other words, if he can attain to the knowledge of that Truth which dwells within him, and which is the same as the Infinite Source of existence, intelligence, and bliss. He who has mastered all the Scriptures, philosophies, and sciences, may be regarded by society as an intellectual giant; yet he cannot be equal to that unlettered man who, having realized the eternal Truth, has become one with it, who sees God everywhere, and who lives on this earth as an embodiment of Divinity. The writer had the good fortune to be acquainted with such a divine man in India. His name was Râmakrishna. He never went to any school, neither had he read any of the Scriptures, philosophies, or scientific treatises of the world, yet he had reached perfection by realizing God through the practice of Yoga. Hundreds of men and women came to see him and were spiritually awakened and uplifted by the divine powers which this illiterate man possessed. To-day he is revered and worshipped by thousands all over India as is Jesus the Christ in Christendom. He could expound with extraordinary clearness the subtlest problems of philosophy or of science, and answer the most intricate questions of clever theologians in such a masterly way as to dispel all doubts concerning the matter in hand. How could he do this without reading books? 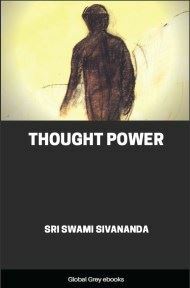 By his wonderful insight into the true nature of things, and by that Yoga power which made him directly perceive things which cannot be revealed by the senses. His spiritual eyes were open; his sight could penetrate through the thick veil of ignorance that hangs before the vision of ordinary mortals, and which prevents them from knowing that which exists beyond the range of sense perception. These powers begin to manifest in the soul that is awakened to the ultimate Reality of the universe. It is then that the sixth sense of direct perception of higher truths develops and frees it from dependence upon the sense powers. This sixth sense or spiritual eye is latent in each individual, but it opens in a few only among millions, and they are known as Yogis. With the vast majority it is in a rudimentary state, covered by a thick veil. When, however, through the practice of Yoga it unfolds in a man, he becomes conscious of the higher invisible realms and of everything that exists on the soul plane. Whatever he says harmonizes with the sayings and writings of all the great Seers of Truth of every age and clime. He does not study books; he has no need to do so, for he knows all that the human intellect can conceive. He can grasp the purport of a book without reading its text; he also understands how much the human mind can express through words, and he is familiar with that which is beyond thoughts and which consequently can never be expressed by words. Before arriving at such spiritual illumination he goes through divers stages of mental and spiritual evolution, and in consequence knows all that can be experienced by a human intellect. He does not, however, care to remain confined within the limit of sense perception, and is not contented with the intellectual apprehension of relative reality, but his sole aim is to enter into the realm of the Absolute, which is the beginning and end of phenomenal objects and of relative knowledge. Thus striving for the realization of the highest, he does not fail to collect all relative knowledge pertaining to the world of phenomena that comes in his way, as he marches on toward his destination, the unfoldment of his true Self. Our true Self is all-knowing by its nature. It is the source of infinite knowledge within us. Being bound by the limitations of time, space, and causation, we cannot express all the powers that we possess in reality. The higher we rise above these limiting conditions, the more we can manifest the divine qualities of omniscience and omnipotence. If, on the contrary, we keep our minds fixed upon phenomena and devote the whole of our energy to acquiring knowledge dependent entirely upon sense perceptions, shall we ever reach the end of phenomenal knowledge, shall we ever be able to know the real nature of the things of this universe? No; because the senses cannot lead us beyond the superficial appearance of sense objects. In order to go deeper in the realm of the invisible we invent instruments, and with their help we are able to penetrate a little further; but these instruments, again, have their limit. After using one kind of instrument, we become dissatisfied with the results and search for some other which may reveal more and more, and thus we struggle on, discovering at each step how poor and helpless are the sense powers in the path of the knowledge of the Absolute. At last we are driven to the conclusion that any instrument, no matter how fine, can never help us to realize that which is beyond the reach of sense-perception, intellect, and thought.